A quick reminder that TODAY is the last day you can transfer American Express Membership Rewards points to British Airways and receive a 40% bonus on the transfer. As I mentioned when I first posted about this promotion, this is historically one of the highest transfer bonuses in recent memory so I am personally taking advantage of it. One new element to consider before you make the transfer is the recent British Airways Avios Devaluation which was announced this week but doesn’t take effect until April 28th. The majority of the “sweet spot” rewards stayed intact. You can still fly short non-stop flights for 4,500 to 12,500 Avios in economy one way. This is unchanged and this is how the majority of people from the US redeem Avios for flights on American or US Airways. If you want to fly business or first class, the amount of Avios has gone up if the flight is over 2,000 miles. This is the only bad news to me but it is really not that big of a deal. For example, JFK-LAX in business class now will cost 37,5000 Avios instead of 25,000 Avios. The simple solution is to book with American Airline miles at 25,000 AA miles instead of 37,5000 Avios. Done. The same goes for JFK-Vancouver on Cathay Pacific which is the only award I’ve ever booked with Avios that would now increase. A lot of bloggers are crying about losing Boston to Dublin on Aer Lingus for 25,000 Avios one way in business class which will now cost 37,500 Avios. My thoughts? Unless you live in Boston, why do you care? You’d still have to pay or use extra miles to get to Boston and frankly unless you have a need to continuously go to Ireland, how many times would you have taken advantage of that flight at 25,000 Avios each way? Some of the devaluation has to deal with earning less miles when you fly paid tickets with British Airways. Since I don’t pay for any British Airways ticket, this has no impact to me. There is now peak vs off peak pricing. All partner awards default as peak and as mentioned, the economy rates didn’t go up. 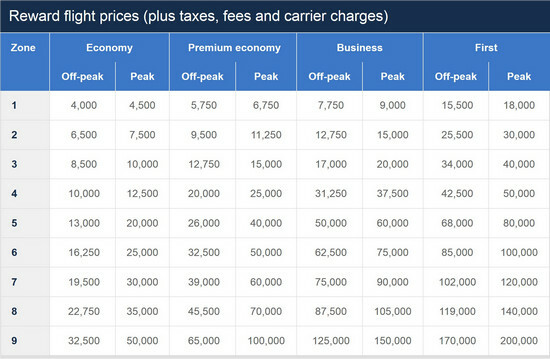 The peak/off peak only matters if you fly on British Airways metal and I won’t due to their crazy fuel surcharges. Lastly, the changes don’t take affect until April 28th, so plenty of time to book trips under the old award chart if you would be affected by the changes. In short, these changes to the British Airways program will not change my focus on how I redeem Avios. I use them for short haul flights on American/US Airways to domestic destinations, Canada or the Caribbean. For example, NY to Antigua (or most of the Caribbean) will still be 20,000 Avios roundtrip. It is still 9,000 Avios roundtrip to Canada or other spots within 650 mile radius of JFK/LGA. All of these prices are still less than what other programs charge so I’m actually thankful British Airways didn’t mess with these award redemptions.